Perivolos beach Santorini is the cosmopolitan spot. It is the natural continuation of Perissa beach with volcanic black sand and crystal clear water. The beach is equipped with umbrellas and sunbeds, in some spots bed size, water sports centers with almost all options and beach volley corts. 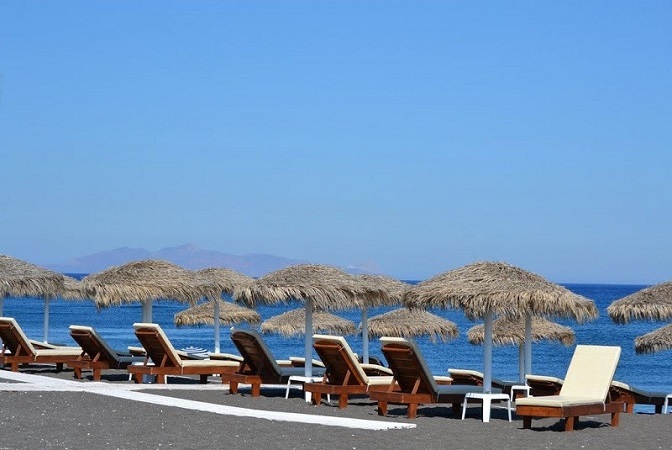 Along Perivolos beach Santorini you will find taverns and restaurants with excellent cuisine, beach bars which are gathered on the beach are considered as the best in Santorini and they organize different events, such as beach volley tournament, etc. This is one of the reasons why Perivolos is so famous among Santorini beaches. Perivolos also has several night clubs where the party last day and night. In the area of Perivolos and the nearby Agios Georgios, visitors have many options for accommodation. You can find hotels of all categories, rooms to let and villas. You can get to Perivolos by local buses from Fira and Perissa.